What would the Fourth of July be without hot dogs? I’d say NOTHING. Yeah sure, you could eat a hamburger or a steak or something, but for me there’s nothing more essential than a grilled hot dog or sausage on a bun to celebrate America. 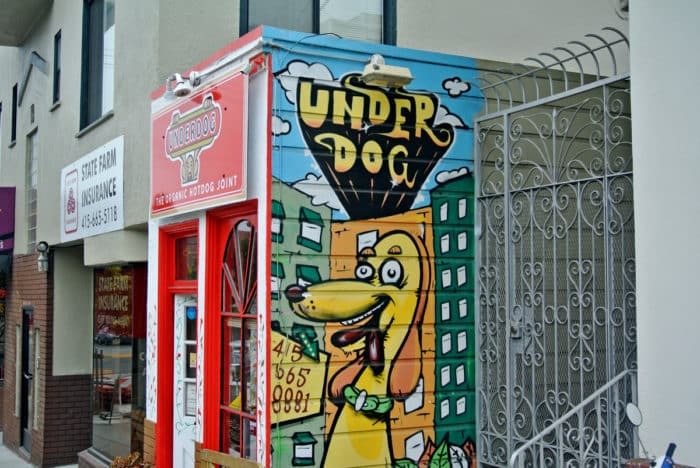 If you live in San Francisco and you want the very best, you better take a trek out to the remote Inner Sunset neighborhood to get your fill at Underdog. This closet-sized fast casual eatery is pretty hippy-dippy, especially when compared to the usual kinds of places I frequent. 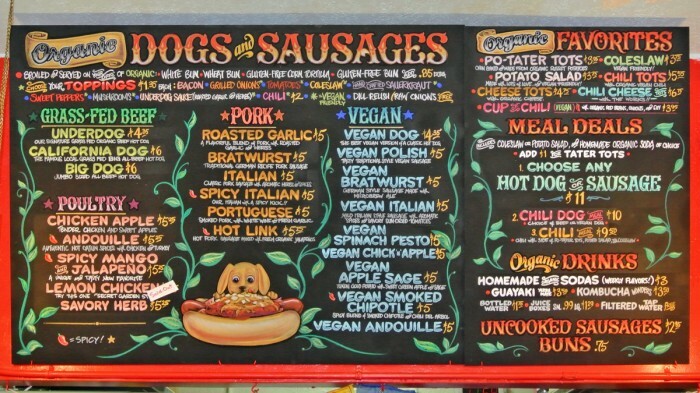 They specialize in eco-friendly, organic hot dogs and sausages and even feature an extensive line of vegan sausages. As much as it sounds like place that would repel a hot-blooded carnivore like myself, it’s actually really fun and charming and everything is downright delicious so there’s no way I could hate it. OK, I’ll admit it. I do have my hippy-dippy tendencies. 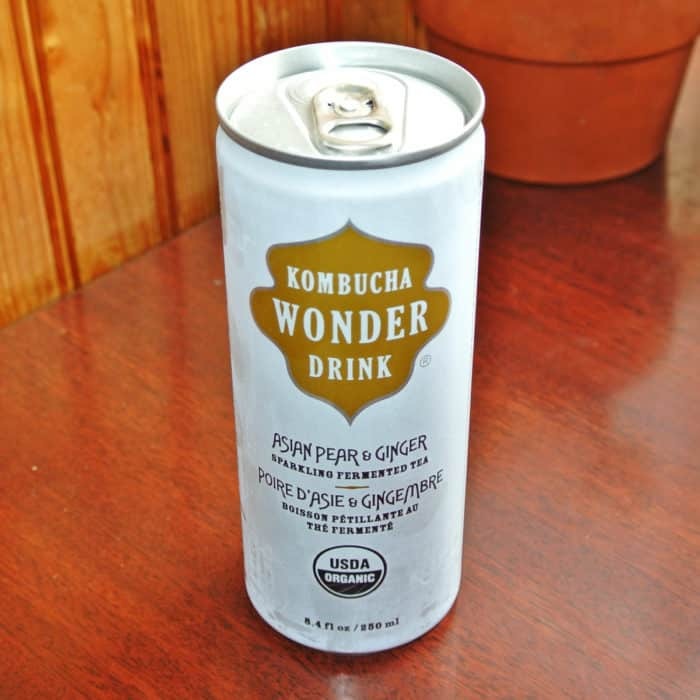 I’ve been a little obsessed with drinking kombucha for a while now and I noticed a canned version of this funky, fermented tea beverage offered on Underdog’s menu. Fine, fine I couldn’t resist. If I’m doing the hippy thing, I might as well go all in. This canned variety was actually quite delicious and had minimal funkiness, but a ton of vivid pear and ginger flavor. And the natural carbonation made it a really pleasant, refreshing beverage to wash down my meal. For lunch though, it was time to run sausage-wild. I decided to let my cashier-slash-cook make all the decisions for me because, honestly, who would know what to get better than her? I asked her to choose one mild and one spicy sausage with whatever toppings she felt would be best. First, for my non-spicy sausage, she selected the Chicken Apple Sausage Sunset Style. A quick glance at the menu and I learned that Sunset Style meant it was topped with sweet peppers, cheese, roasted garlic, and underdog sauce which is a roasted garlic sauce with herbs and spices. The sausage, first and foremost was awesome. It was big, meaty, juicy, snappy and flavorful. It was absolutely the best chicken sausage I’ve ever tasted. On it’s own, it’s mild as expected, but with the addition of the Sunset Style toppings it turned into something so much more than the sum of its parts. As I’ve learned elsewhere in SF, the quality of the produce is spectacular so those sweet peppers were pretty amazing and the addition of the runny, melted, cheesy, saucy toppings made for an awesomely bold flavor and texture combination. For my spicy sausage, the cashier selected the Hot Link Wild Style for me. 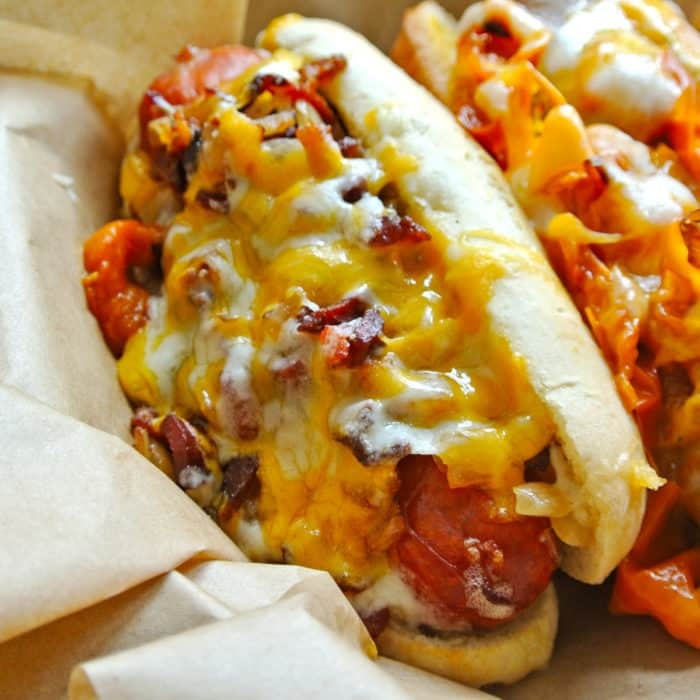 At Underdog, Wild Style means it comes topped with bacon, cheese, and sautéed onions. Uhh, yes please. 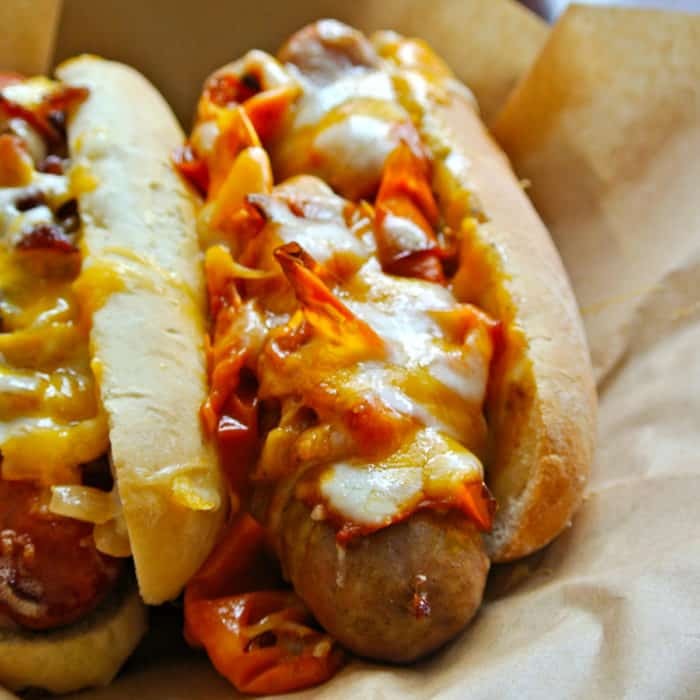 This pork-based link was bright firetruck red and had enough girth to make even Joey Chestnut second guess it. It had a real pleasant snap with each bite and that super sloppy topping combination was absolutely delicious with it. Unlike the sausages at Rosamunde, which are rather skinny and require two to fill a sandwich, just one rather thick one is all you need here. And it wasn’t actually as spicy as the name would suggest either, but I didn’t mind. This was just a really excellent sausage accentuated and highlighted by the outrageous wild style toppings. For Amy’s lunch, she started with a Roasted Garlic Sausage. She got the Roasted Garlic sausage without toppings and to be honest, it didn’t really need any. That garlicky, porky sausage was incredible, certainly the best of the bunch we ordered. Everything about it was just right and truly amazing. 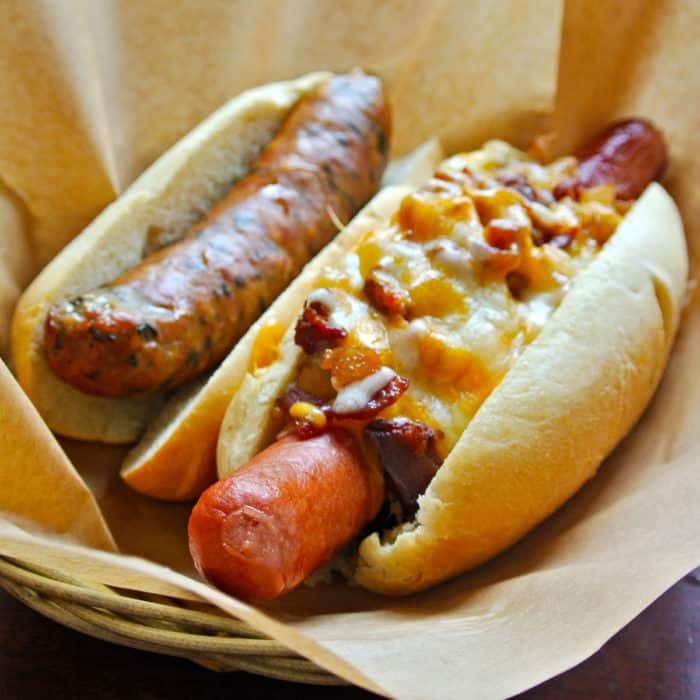 In addition, she had the California Dog Wild Style which is Underdog’s natural organic take on a jumbo all-beef hot dog. This hot dog was everything you could possibly want from a hot dog without any of the unwanted extras like nitrates or preservatives you probably don’t want to be putting in your body. You could almost call this thing healthy… that is before the addition of wild style toppings. The dog on its own was absolutely incredible, a thing of beauty really. It was definitely the best, most delicious beef hot dog I’ve ever tasted and I’ve certainly had my fair share of dogs. And I’m super-excited about the fact that they sell these hot dogs uncooked for home preparation. I know I’ll be back to pick up some more. Finally, I felt the urge to try their Homemade Vegan Potato Salad. 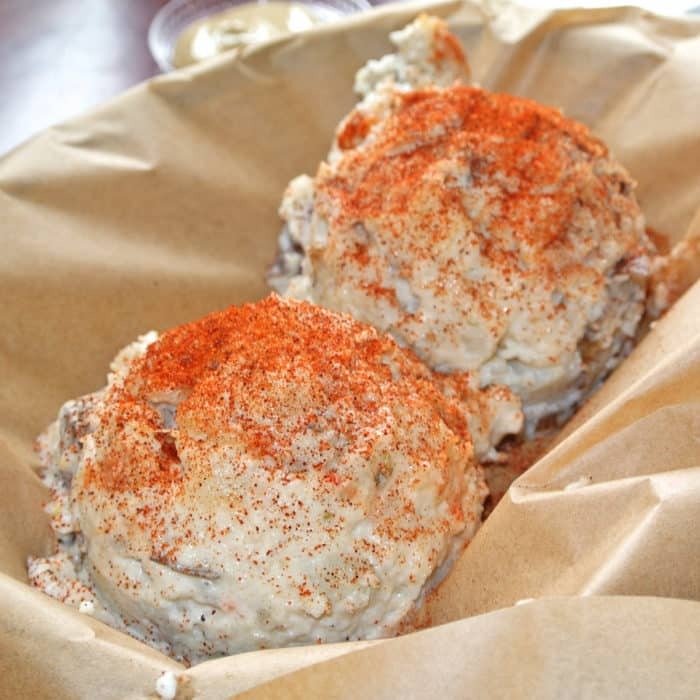 I know, I know… vegan potato salad? Yeah, there’s no mayo in it, but I promise you won’t miss it. It definitely has a satisfying creaminess from the vegenaise and the roughly mashed skin-on potatoes were excellent, especially with the hearty shakes of powdered red spicy seasoning. I even added some of their homemade organic habanero hot sauce to a some bites to kick it up a few notches, which I found to be quite a nice modification. Don’t knock this vegan potato salad ’til you try it. 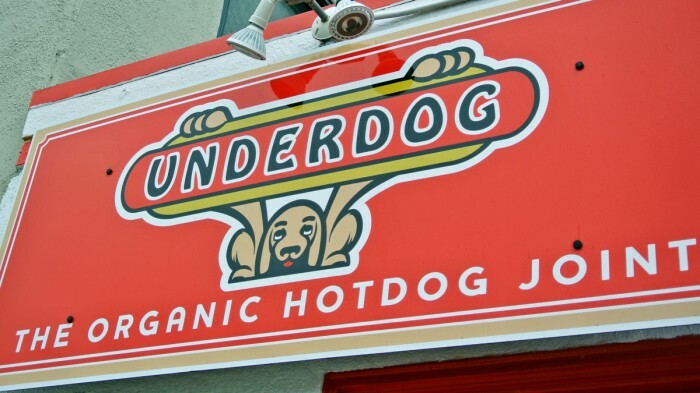 Underdog is a sort of magical place where meat-eaters and vegans can come together and unite over some of the most incredible renditions of the American classics we all know and love. It’s a truly amazing place and these hot dogs and sausages are as good as they get. Also, if you still haven’t purchased any hot dogs or sausages to barbecue at home at your Independence Day barbecue celebration, you’re in luck. Underdog sells most of their offerings prepackaged and uncooked for home consumption. These dogs aren’t exactly cheap, but you’re not gonna skimp on quality for your party guests now, are you? 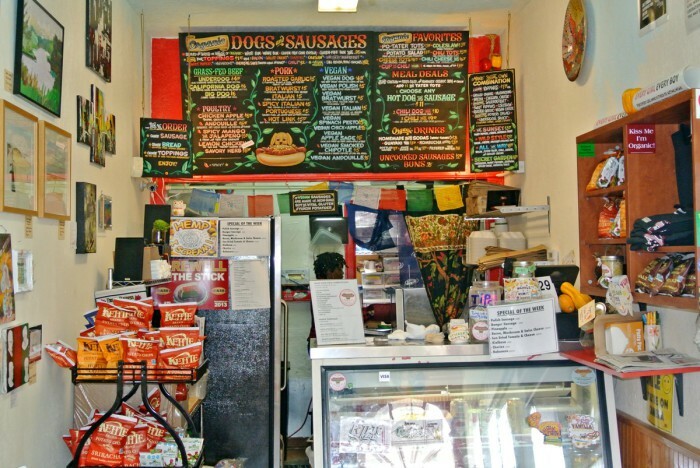 Got another epic sausage joint in San Francisco I should check out? Let me know in the comments below.